Find out if a programmable slow cooker is right for you. Also you can enter at the bottom of this post for a chance to win a 6 quart programmable slow cooker sponsored by Hamilton Beach. I didn’t jump on board with slow cooking a while back when it started to get really trendy. I didn’t even own a slow cooker two years ago. Then I bought a small basic one, like this but without the zebra stripes, which I totally wish it had had because then I might have used it more often. I think I used it a total of three times in two years. When Hamilton Beach sent me a bigger 6 quart programmable slow cooker (similar to this one) I expected to like it a lot more but I didn’t expect to fall in love. Which is what happened. I use my slow cooker all the time now, usually twice a week. I make all kinds of stews and soups and also chicken dinners, pulled pork and even scalloped potatoes (check out my Tex-Mex Slow Cooker Scalloped Potatoes over here). 1) It’s Nice and Roomy: I can fit enough food for our dinner and for leftovers the next day in a single slow cooker cooking session. 2) It’s Easy to Use: I originally worried that a programmable slow cooker would be complicated to figure out but I’ve barely needed to look at the instructions on mine. It’s really intuitive. You turn it on and choose Manual, Program or Probe. Manual Mode, you set the temperate (high, low or warm) and you’re done. Program Mode, you set the time for how long you want it to cook and the temperature. Probe Mode, you set the temperature you want it to cook at and the internal temperature of the meat that you want it to stop cooking at. That’s it. Super quick and easy. You put the probe right into the meat. For the whole time it tells you what temperature the meat has reached. Not only are you able to see the temperature climb but it also stops cooking when the desired temperature is reached. At that point, it switches to warm and keeps your roast at that temperature until it’s time to eat. If you have a stew or casserole that you want to re-heat, transfer the refrigerator-cold food from its container into the slow cooker. Put the probe in the food. Set the temperature you’d like the food to reach. It will heat it up until the temperature is reached and then switch to warm until it’s time to eat. 4) The Warm Setting is Automatic and Awesome: If in Manual Mode you can set the slow cooker to warm and it keeps food warm. My old small unprogrammable slow cooker did that too. The Warm Setting gets really amazing with the programmable slow cooker. In Program Mode: The slow cooker switches to warm when your time has run out. If you set the slow cooker for 6 hours, when the 6 hour point is reached the slow cooker automatically flips to Warm and keeps food at a warm temperature until you’re ready to eat. In Probe Mode: When the temperature you’ve set it to is reached, it switches to Warm. Then the food stops cooking and stays at a warm temperature until you’re ready to eat. I love that! It means that if you’re late getting home, or if your recipe doesn’t need to cook for the full time you’re away, the slow cooker will stop cooking the food but will keep it ready for you just the same. I’m pretty tickled with my slow cooker these days. I’d say that if you’re thinking of getting a new slow cooker, a programmable one with worth the extra money, especially if you’re going to use it during the day when you’re away from home. Tell me about your slow cooking experiences for a chance to win a slow cooker! I’d love to know the reason why you love your slow cooker. Or the reason you don’t like your slow cooker. Or your favorite thing to cook in a slow cooker. Or anything at all about your slow cooker, come to think of it. If you comment below telling me one of these things, you’ll be entered to win a Set ‘n Forget Programmable Slow Cooker(#33967) sponsored by Hamilton Beach. If you win the slow cooker you’ll also receive a free copy of our cookbook Where Slow Food And Whole Food Meet: Healthy Slow Cooker Dinners From Our Kitchens To Yours. Extra Entry #1: As you may know, all proceeds from the sale of the cookbook go to the Second Harvest Food Bank of Central Florida. In honor of this, we’d appreciate it if you’d tweet out something about what people can do to end hunger in the US. Include the hashtags #slowNwholeCookbook, #sweepsentry and mention @2harvestcfl in your tweet. Comment below with the link to your tweet so I can verify if you win. Extra Entry #2: Thank Hamilton Beach for this slow cooker giveaway in a tweet. Make sure to include #giveaway, #sweepsentry, @hamiltonbeach and me, @cookthestory, in your tweet. Comment below with the link to your tweet so I can verify it if you win. Sweepstakes ends on October 22, 2014. Disclosure: Hamilton Beach provided me with a slow cooker and is providing the slow cooker for giveaway. I was not compensated in any other way. All opinions are my own. I love my slow cookerS, all 5 of them. I used mine last night to make dinner for a coworker who just had breast cancer surgery. I used mine at least once a week, if not more. There is no such thing as too many slow cookers. I work all day so when I get home the last thing I want to do is cook dinner… I LOVE slow cookers because they are so easy… start in the morning and done when we get home from work. I work from home but I hear you anyhow. The day so often gets away from me that if I haven’t started dinner earlier, it’s going to be a mad rush later, for sure. I love slow cookers, but mine kind of burns things if I don’t stir, which kind of defeats the purpose of the slow cooker. If I won I would like to make my pinto beans. My slow cooker is ok for what it is but it doesn’t have any programmable features. My favorite thing to cook in a slow cooker is lemon roast chicken. As a mother of two little ones, a full time student and part time employee I use my slow cooker about 4 times per week. It is great to have dinner ready when we get home. I don’t have a slow cooker, but I like using my mom’s when I visit her. My favorite thing to cook is lemon chicken with paprika. I love that I can make a really delicious meal with not much effort. I love using my slow cooker for lots of things. Just used it to make chili yesterday, and last week, it was apple butter! It saves so much time and I can just throw all the ingredients in in the morning and have a healthy dinner at night. My favorite dish is italian seafood chowder. I have 4 slow cookers and love them all! I have a 2, 4, 6 and 8 qt. None are programmable, so I’d love to win this one! Also, I’m determined to get the Casserole Crock! I make roasts, soups, chili, and casseroles in my Slow Cookers….thanks for the chance to win! I liked having a slow cooker for making a few things, but I got rid of it because the ceramic insert developed a really nasty smell (in the unglazed rim on the bottom). I liked it best for making granola. There are a bunch of other dishes I’d make if I had a good one. I have to say, though, that since I am retired and therefore home most of the time, the smells emanating from the slow cooker are sometimes overwhelming. That said, I would still be interested in trying a slow cooker again. One of my favorite slow cooler meals is beef stew or chicken stew. My slow cooker is small and ancient. I love my slow cooker because I can make delicious healthy meals without spending all afternoon in the kitchen. I love my slow cooker for many reasons. I live in Florida and even with the air conditioning on, it’s just too hot to heat up the oven or even the stove top for that matter. For that reason alone I use my slow cooker several times a week! I also love the ease of using my slow cooker. Just throw in the ingredients, set it and let it go! It’s so convenient. I also love that I can get more than one meal out of the recipes I make in my slow cooker, so not only is it a time saver, it’s a money saver as well. My family has a few favorite things I cook in the slow cooker…breakfast casserole, pulled pork, pot roast, chicken and dressing, yogurt, bread pudding, mashed potatoes, fish packets, falafel and Sunday gravy…just to name a few! :) Thank you for this awesome giveaway opportunity! I love being able to put something simple – like pinto beans and a ham shank – in my slow cooker in the morning and have an amazingly tasty meal to eat later. There’s something so magical about this! Wow. I have been cooking with slow cookers for years. There are so many things I love about them. Every December we throw a Christmas party and serve soups. My crockpots are positioned all over the house filled with all kinds of delicious soups. Love it! I love using the slow cooker on days when I won’t be home on time yo get dinner on the table at a reasonable hour. I also like to use it for meals that need time to cook tenderly. I use my Crockpot a couple times a week. I love making freezer meals using it and especially enjoy the convenience of not having to use my oven often during the hot summer months. I love the slow cooker for making things so much easier without heating the kitchen or requiring constant vigilance. I like to cook using a slow cooker b/c it makes dinner time so much easier – I can put everything in the slow cooker in the morning and by dinner time it’s ready to serve! My favorite recipe is slow cooker lasagna!! 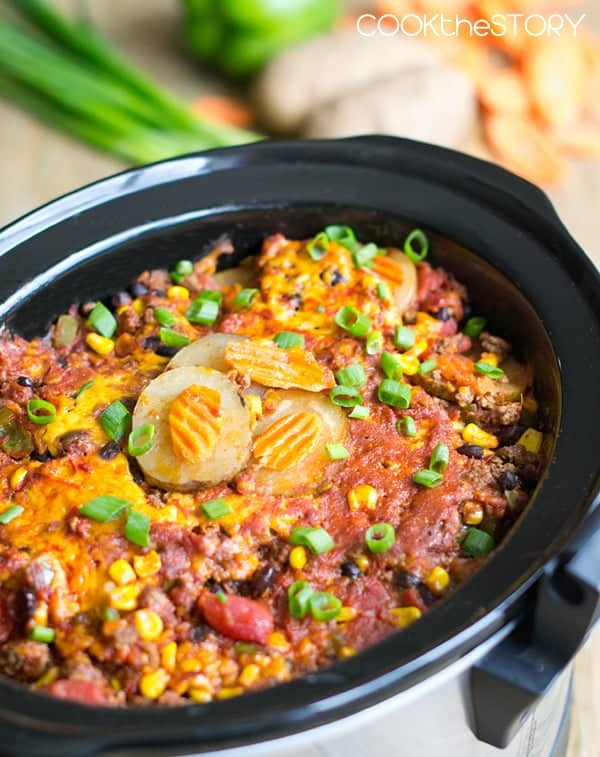 I love my slow cooker because it makes supper time so easy, I can put everything in the slow cooker in the morning and by dinner time it’s ready!! I would make seafood chowder with shrimp and crabmeat. It is so yummy.